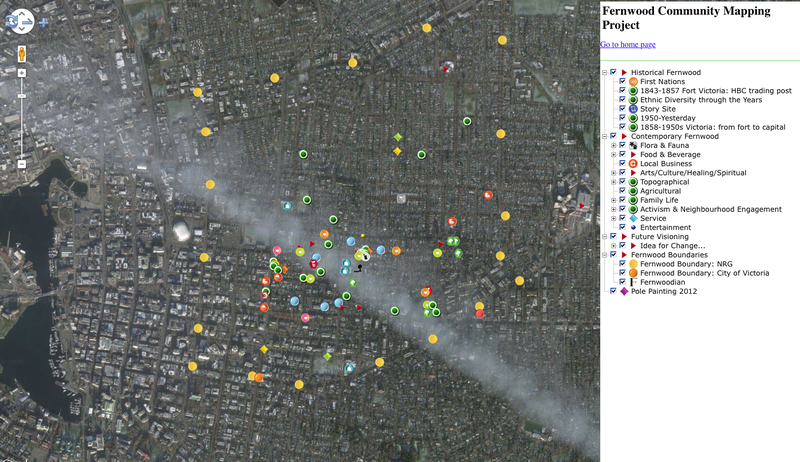 This project is alive, an on-going, growing, functional mapping of the Fernwood community of Victoria. Anything is possible. If you would like to be involved in mapping Fernwood jump on-board. We are volunteers piecing it together street by street, tree by tree. Mapping the ‘Hood' “We abuse land because we regard it as a commodity belonging to us. When we see land as a community to which we belong, we may begin to use it with love and respect”, wrote Aldo Leopold. With this in mind, we are initiating a project to map the heart and soul of our community. Have you ever wondered about the lay of the land here in Fernwood – our waters and our bedrock, our layers of history? Where streams ran? The history of our spring? Our Garry oak meadows and camas fields. How did First Nations use the land? What stories were told about special places and what were their original names? Were there bears and cougars at Gladstone and Fernwood? How were the early farms laid out and what did they grow? Did we have a tiny Chinatown? Where besides the British Isles did our early settlers come from? These are only a few of the questions we will consider as we set out to map Fernwood. Their answers are scattered in history books, old maps, and oral histories. Community mapping, also called participatory mapping, is one way to bring these diverse approaches together. The real aim of this kind of mapping is to open up new questions and new ways to look at our community. Most of the maps we use help us figure out how to get from here to there. The Fernwood map we create will open wider possibilities. It will be a treasure map of our neighborhood, a way to record the ancient songlines of this place. We anticipate that we will end up with a printed map, but we also hope to have an interactive web-site as part of the Vicipedia concept, an on-line access point for information on our city. To do this, we invite the community’s help. We need your ideas and your energy. Participatory mapping has been around in this part of BC for a while now. Numerous communities including many of the Gulf Islands, Vic West, the Highlands and others have already made their maps. We’re lucky to have their examples and inspiration. This community mapping project is one of many offshoots of the vision articulated by Mark Lakeman of Portland about how we take back our neighborhoods and create the city spaces we want to live in. Maps are powerful tools. Historically, most maps were made by invading powers or those seeking to control the land. Made by geologists, they indicate where to look for minerals and oil. In the hands of politicians, they map voting trends, power blocks, and riding boundaries. Done by the power elite, they map areas of wealth and poverty, where transportation will run and where it won’t, school districts, and where to bury toxic waste. Knowledge is power and maps are the repositories of layers and layers of knowledge. The Penan people of Sarawak, who protested the deforestation of their land, were arrested if they were found carrying a map. Maps made by and for the community are another entity. Such maps chart existing networks and create new ones. Maps make energy visible. Maps make friends. This project is an integral part of the Placemaking energy, that process of having the community become its own source of power and initiative rather than waiting for City Hall to tell us what kind of community we will be. This past spring, several Fernwoodians attended a class on community mapping led by Maeve Lydon and Ken Josephson of UVic’s geography department. This was the catalyst to get going on a vision several of us shared. This mapping project is a chance to create an inventory of our values. Fernwood is in the process of amazing, mostly wonderful changes. Fernwood has been part of Victoria’s heartwood for well over a century, a long time in a city the age of Victoria. We remain heartwood. This project is a way to know more deeply a community we cherish. It is a chance to map the example we’re becoming of urban vitality and community-mindedness: our brilliant restaurants and fantastic coffee; our chicken coop tours and sustainable gardens; our initiatives in affordable housing; our amazing Belfry Theatre… The list goes on. We invite Fernwood residents to come together to think about what else we want to see here. We need to hear from everyone, young, old, long-time residents and newcomers. How we proceed and what the project will ultimately look like depends on community input and interests. This is about accessibility at all levels. We will need lots of help “ground truthing” – mapmakers’ language for walking the streets, checking how accurately the available maps reflect the actual reality of our neighborhood. We’ll need help gathering oral histories, creating base maps for community mapping events, and so much more. What do you love about Fernwood? How could we make it better? Are there special rocks, trees, corners that you love? What do you need to make life in Fernwood more complete – a particular type of store or venue, more recreation opportunities, different kinds of child care, bocce ball in the streets, mandalas in our intersections, more community garden space, barbecued vegetables in the square? With luck, we’ll sing new songlines into being as they arise from new stories and new visions of Fernwood’s ongoing evolution. Our first big evening will be Monday, September 21 at the monthly Placemaking meeting at the Cornerstone. Ken Josephson and Maeve Lydon will be speaking about the mapmaking process. You are all invited. We look forward to seeing you there. If you can’t attend the meeting but would like to take part or just stay informed, email mapping@fernwoodnrg.ca and we’ll make sure to keep you in the loop.